Light reddish mahogany color. Nutty aromas of almond windmill cookies and nut roll bar with a velvety, bright, dryish medium-full body and a warming, breezy brown butter, multigrain bread, dried fruits, and rum raisin finish. A fantastically malty and rich barleywine with incredibly seamless flavor and texture. 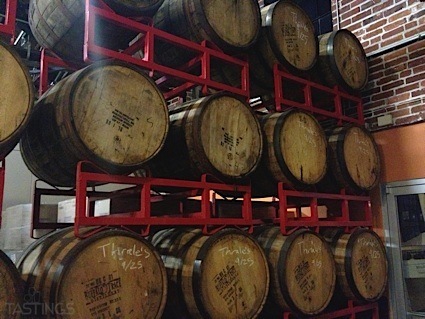 Bottom Line: A fantastically malty and rich barleywine with incredibly seamless flavor and texture. 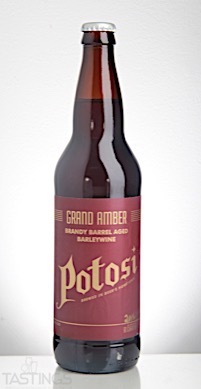 Potosi Brewing Company 2016 Grand Amber Brandy Barrel-Aged Barleywine rating was calculated by tastings.com to be 93 points out of 100 on 11/14/2017. Please note that MSRP may have changed since the date of our review.